We would like to acknowledge our current sponsors of Marine Research here at the Center for Coastal Marine Science. Thank you. Unocal Vice President of Real Estate. 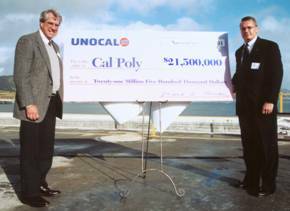 The Cal Poly Pier is owned by the State of California and the California State University system. However, the pier is not supported by State funds. The Center for Coastal Marine Sciences is dependent on grants, the income from the endowment established by Unocal, and donations of corporations, alumni and friends to continue our operations and to further develop the Pier as an educational facility. We would like to thank the following donors for their support of the pier and our marine education program.